Salesforce Lightning is a suite of business app building tools that allow users to develop solutions visually. The application enables this with its drag-and-drop user interface, allowing users to seamlessly pick and place elements anywhere on the window. Additionally, Salesforce Lightning makes it easy for developers to hasten their production process. It does so by providing them with custom and standard components they can mix and match to craft their unique applications. And since Salesforce Lightning is built on the Salesforce App Cloud, it is able to provide anyone with sophisticated tools to design, test, and deploy modern business solutions. On top of that, there are also resources that let them make sure they are adhering to best practices guidelines. Gone are the days when developers have to meticulously write codes line by line to build gorgeous applications. With Salesforce Lightning, they can come up with the same beautifully designed and top performing applications by creating them visually. That is, they can drag-and-drop components across the interface until they are satisfied with the arrangement of elements. Additionally, Salesforce Lightning facilitates the speedy building and deployment of apps through reusable components that can be custom or standard. Whichever the case, these can be easily configured and combined to create unique applications. Aside from that, businesses and their partners can sell their components on AppExchange and enhance their component library by buying from the same platform. 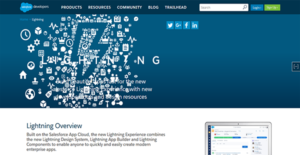 Salesforce Lightning assists developers in creating sleek and modern applications by providing them with style guides and best practices resources. They can utilize these to learn about what business users expect from their apps not just in terms of performance, but in the visual appeal as well. To help developers reduce their time to market, Salesforce Lightning offers their UI Library and CSS Framework for download. These can be employed as templates to fashion beautiful and functional applications that reach their target audiences as soon as possible. If you are considering Salesforce Lightning it may also be a good idea to check out other subcategories of Best Rapid Application Development Software - RAD listed in our database of SaaS software reviews. There are trendy and widely used systems in each software category. But are they essentially the best fit for your enterprise’s special requirements? A market-leading software solution may have thousands of users, but does it present what you require? For this reason, do not blindly shell out for popular systems. Read at least a few Salesforce Lightning reviews and consider the factors that you want in the software such as the fees, main features, available integrations etc. Then, select a few solutions that fit your requirements. Check out the free trials of these apps, read online opinions, get explanations from the vendor, and do your research meticulously. This exhaustive homework is sure to assist you choose the finest software platform for your company’s unique requirements. How Much Does Salesforce Lightning Cost? Salesforce Lightning is an app building platform offered by Salesforce. Parties interested in creating business apps with the service can request a custom enterprise pricing from sales by phone, email, or web form. We realize that when you make a decision to buy Rapid Application Development Software - RAD it’s important not only to see how experts evaluate it in their reviews, but also to find out if the real people and companies that buy it are actually satisfied with the product. That’s why we’ve created our behavior-based Customer Satisfaction Algorithm™ that gathers customer reviews, comments and Salesforce Lightning reviews across a wide range of social media sites. The data is then presented in an easy to digest form showing how many people had positive and negative experience with Salesforce Lightning. With that information at hand you should be equipped to make an informed buying decision that you won’t regret. What are Salesforce Lightning pricing details? What integrations are available for Salesforce Lightning? Salesforce Lightning can communicate with other apps and services in the Salesforce family of business solutions. If you need more information about Salesforce Lightning or you simply have a question let us know what you need and we’ll forward your request directly to the vendor.